I had the horrible realization last week that all the skirts in my closet are the wrong length! I’ve apparently just left behind a ten year phase of wearing skirts that hover close to or below the knee. 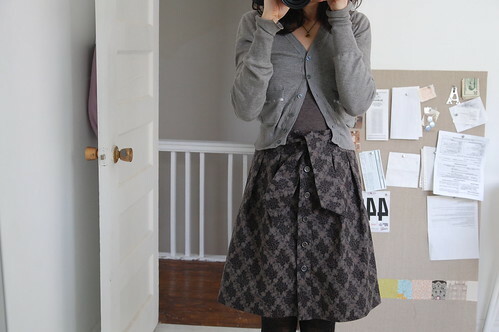 Right now I’m loving the idea of a mini-ish skirt with tights and flats. I’ve had Jenny Gordy’s Tulip Skirt pattern from Stitch magazine on my list for months so this was the logical place to start building a new skirt wardrobe from. I’m a huge fan of her lovely line, “Wiksten“. I would happily wear anything she designed. Luckily, Jenny just posted her errata from the pattern which helped to sort out some things that confused me when tracing the pattern sheet. The sewing is simple for this skirt, the most confusing thing were the directions and lack of diagrams to help clarify. I’m still not sure if I did the facing correctly, I ended up just using the regular waistband pieces to create a matching facing. It seemed like there were other pieces I was supposed to trace on the pattern sheet, but they didn’t make sense to me. The one thing I modified was the tie. I wanted something a bit bigger, longer, perhaps evoking some Blair Waldorf. As I was cutting out the fabric (which is a Daiwabo print) and eating some blackberries Andrew bought me, I realized that they were both the same colour. I’m loving this dark purple-y colour so much right now. 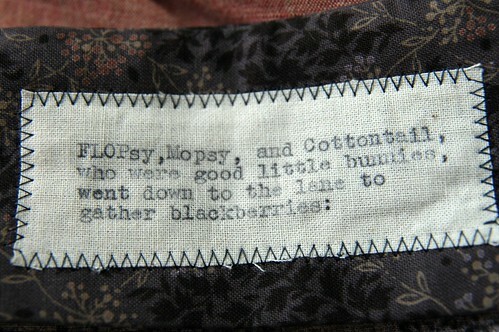 I was pretty sure I’d find a good quote mentioning blackberries in ‘Peter Rabbit’ by Beatrix Potter for my typewritten label. I have the entire set of her charming books. 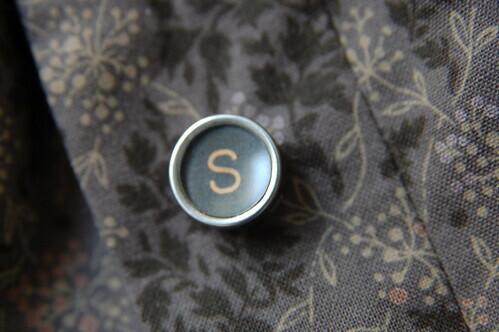 As for the buttons of the skirt, I’ve been holding on to a set of typewriter keys for a very long time with the intention of using them as buttons on a skirt. Let me first say that these came from a typewriter that I found banged up on the streets of New York. I took it home to see if it could be saved, but really it was beyond repair. I would never harm a working typewriter and neither should you! I carefully removed all the buttons and have kept them all these years. Of course, then there was the dilemma of what to spell with my five buttons. Keeping in mind I couldn’t repeat any of the letters. In the end, the perfect word seemed to be, ‘SKIRT’. oh karyn, i love this! it is great to see all the variations on the flickr group – i feel like you could make it a dozen times over in different fabrics and have 12 different skirts! loving the simplicity of the wiksten line too, wondering if she has anything for 2009? awww. i love the buttons!!! they are so cute!!! karyn, you make everything look so easy!!! What a lovely story! The buttons, the label and of course the skirt, you’ve inspired us all once again. I really enjoy your blog, it’s my favourite one. Sooo nice! I have that issue of Stitch, but wasn’t inspired by the photo of the Tulip skirt in there… It looks totally different with the great fabric you chose, and the longer ties. I want to try out the pattern now! Oh! I love this! I am so envious because it is obvious that you have such attention to detail. When I sit in front of the sewing machine, something weird happens to me and I just want to finish it so I go fast and the results are always sloppy. I need to channel your precision. I absolutely love your finished product and the creative element with the typewriter buttons. Your creativity never seems to surprise me! You always come up with such wonderfully awesome ideas and always looking beyond professional! Definitely an inspiration! Love the skirt, the tag, the tie and of course the buttons! p.s. i agree with all of the above. I love all the thoughtful details you put in your realizations. truly makes them one of a kind precious items. fantastic! genius use of the buttons! I love the typewriter buttons idea. And I agree, never harm a working typewriter. They’re just too precious, just as this skirt. Your skirt is very lovely. I especially love how the fabric choice and skirt design compliment each other so perfectly. And your finishing touches add the right amount of ‘handmade’ personality. This skirt, as do all of your pieces, turned out beautifully! I love all the little subtle details. Have you thought about making the asymmetrical folds skirt on the front cover of the same magazine? Great job! i just found your Crafty To Do list.. i need to make one. i have all these projects i come across and need a central place to keep them so i don’t forget any 🙂 anyways, Love the skirt! !